Chief Warrant Officer (CWO) Paul Martin, CD joined the Army in April, 1989, at the age of 17, with the Princess of Wales’ Own Regiment (PWOR) in Kingston Ontario. In 1992 he completed the Infantry Section Commander’s Course and was promoted to Master Corporal. In 1996 he was promoted to Sergeant, and in 1998 he survived the 6B Course in Gagetown New Brunswick leading to his promotion to Warrant Officer in 2000. 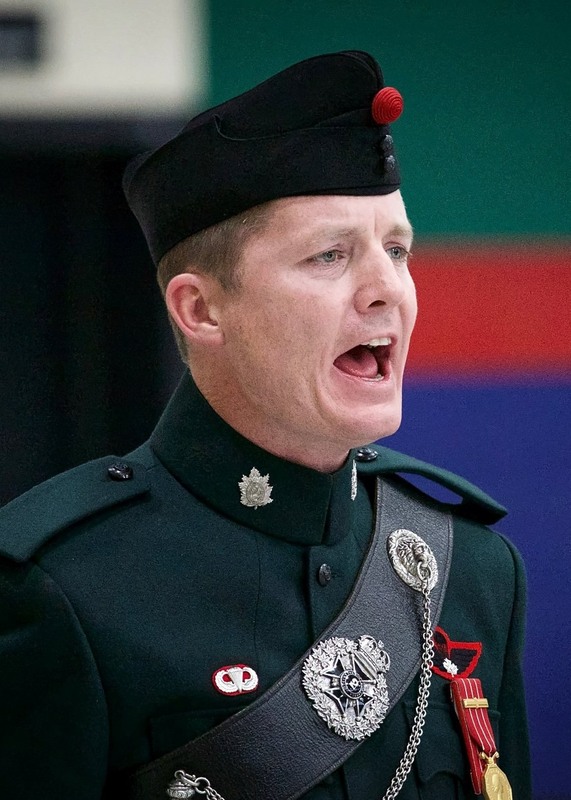 He moved to Ottawa in 2000 for his civilian career then to Pickering in 2005 and joined The Queen’s Own Rifles of Canada. He was appointed as Company Sergeant Major (CSM) of the newly reformed Buffs Company in Scarborough before later serving as the 60th CSM and then Quartermaster Sergeant Instructor (QMSI) of the Regiment. He was promoted to Master Warrant Officer in 2008, then to CWO and appointed Regimental Sergeant Major (RSM) in April, 2014. CWO Martin was active for just under a month with Operation Recuperation during the Ice Storm of 1998, delivering supplies to rural areas, clearing routes, and moving local citizens. He is very proud to have helped train many outstanding soldiers that went on to serve in Bosnia, Afghanistan, and other places around the world. He has been on parade for four royal visits, including Princess Dianna’s in 1992, and toured France and Belgium with a Queen’s Own contingent in June, 2014 and April, 2017. He has taken part in many infantry competitions and military hockey tournaments with great success. He served as RSM of a 500 person Territorial Battle Group (TBG) for two weeks in Petawawa during Exercise Stalwart Guardian in 2015. CWO Martin’s civilian accomplishments include a Bachelor of Arts in Economics from Queen’s University in 1996 and a three-year diploma in Computer Engineering from St. Lawrence College in 2000. He currently (2017) works as a Software Development Lead for Dealer-FX Group Inc., a software company in the automotive industry. He is married to Gillian Martin, Assistant Headmaster at Havergal College, and together they have three children; ten year-old Kylie, eight-year old Zoey, and six-year old Sawyer. He is very active in coaching hockey, baseball and soccer with his children. CWO Martin has had a great time over the past two decades serving his country as a soldier, and it has made him the person he is today. He has had the privilege of serving with many fantastic people and two outstanding regiments. He is honoured to have carried the torch for the QOR of C.